ILS offers a wide range of compressors and accessories to meet your specific application requirements. 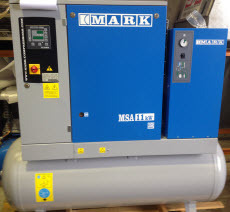 Most models include a fully automatic operation feature plus an air dryer and combination of main line oil filters to supply clean and dry instrument quality air. ILS also supplies high quality air couplings, adaptors, high pressure hosing, air guns, filter/regulators, solenoid systems and instrumentation. A cone crusher is a primary crusher with a feed size of 50mm crushing down particles to a size of 3mm. Utilising two discs on a vertical plane, disc mills are used to coarse grind or fine pulverize samples. ILS offers a range of drying ovens ranging in size from 518 litres to 4 cubic metres. Our ovens are lined in stainless steel and come in either electric or LPG/propane gas fired options. All ovens are supplied complete with storage racks or trolleys. 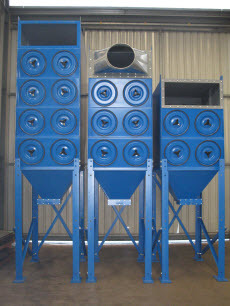 ILS has a range of dust collectors with the ability to filter for dust or fumes. Suitable for sample preparation and fire assay, our dust collectors are available in various sizes and configurations, ranging from small mobile units of 700 cubic feet per minute (CFM) up to large multi-units with capacities greater than 20,000 CFM. All our systems are engineered to client equipment requirements - enquire about our recommended designs for your site requirements. ILS offers a variety of models of jaw crushers with crushing capabilities down to 2mm. Typical maximum feed sizes range from 50mm to 250mm. Various models of pulverising mills are available for both batch and continuous milling and to suit various pulveriser bowl capacities. Pulverise batch samples from as small as 5g up to approximately 3.5kg using either a single puck disc bowl or the ring arrangement in bowl. ILS is able to supply an intermediate crusher suitable for crushing down material to a 1mm diameter from a maximum feed size of 40mm. Offering the reliable solution for the consistent splitting of samples. Our rotary dividers are configured to a desired percentage split. Models are available for full retention or residue bagging. ILS has a range of scoops available in different sizes in plastic, aluminum or stainless steel. We carry a range of large Jones field splitters, bench splitters and pulp splitters, in various slit widths, complete with three trays. ILS carries a range of standard length benches. 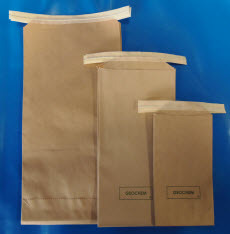 These include popular lengths including 1.5m, 1.8m, 2.4m and 3m. Manufactured in steel, our benches can be supplied in either stationary or mobile configurations and with an optional rubber top. We can also manufacture benches to meet your specific needs, either in custom dimensions or with alternative bench tops, including wood. ILS carries a range of workstations that are suitable for all applications in sample preparation, fire assay and metallurgy. 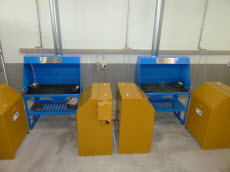 Workstations are available in 1.2m, 1.5m and 1.8m lengths, with light, downdraught extraction and spigot options.